Mom, the Intern: A decade of marriage. 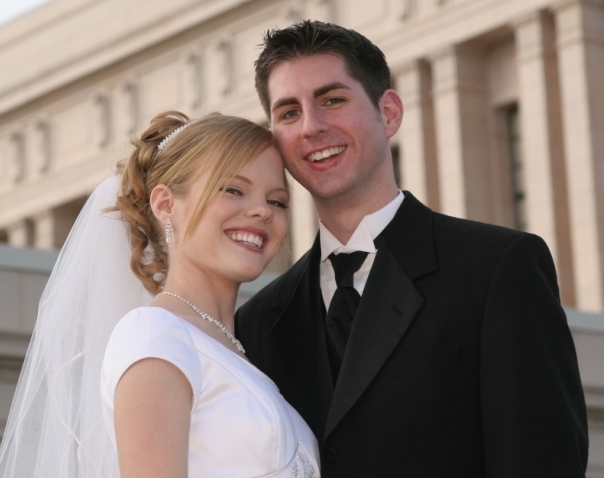 On this day ten years ago, I was running all over town, getting my hair and makeup done, completely thrilled I was about to lock it down forever with the man of my dreams. The only thing I was nervous about that day was that Dillon would die in a terrible car accident since he was driving his brother's stick-shift. But, he arrived safe and sound. We went into the Mesa Temple as two separate people and came out as a family. As far as Best Days of Jenna's Life go, December 30, 2005 tops the chart. Some of the finer details of the day have since faded from my memory, but there are a few things I'll never forget. Just before we were married, we were led to an empty room in the temple to wait for a bit. Our sealer (the man who married us) would soon be in to give us some counsel and direction about what would happen during the ceremony. But until he arrived, we sat together, hand in hand, unable to fully believe that it was REALLY HAPPENING! We whispered excitedly together, all smiles. I have never felt so thrilled in my life. After we were officially married, our family came around the room to congratulate us one by one. One of the last people was my sister-in-law, Rebecca. She tearfully hugged me and said, "Now I finally have a sister!" I, too, broke down in tears. I realized then that marriage doesn't just change the bride and groom, but the whole family. Dillon's people became my people, and my people became his. It was a touching discovery. As we walked about the Mesa Temple grounds to take some pictures, Dillon carried my heavy, long dress train. He smoothed it out over the ground so carefully for each photograph, and then faithfully picked it back up whenever it was time to walk again. I didn't know it then, but this simple act exemplified Dillon's devotion to taking care of me. Since December 30, 2005, he's been carrying my metaphorically heavy train -- encouraging me through college, soothing me when I felt oh-so-sick during pregnancy, caring for our babies and children at the end of every long day, and just generally picking up all the slack. I didn't need a bridesmaid then and I don't need one now -- Dillon is the one I turn to when life gets too heavy. Our reception was beautiful. 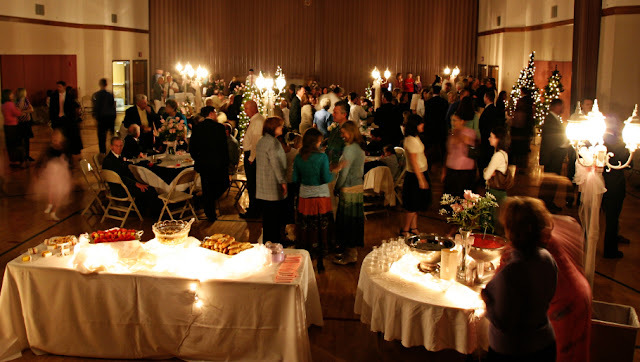 My family and some dear friends set up the reception hall, and all we had to do was show up that night. It took my breath away to see it so immaculately decorated with lit Christmas trees, pink roses and elegant lamps. I was so grateful to celebrate our special day in such a pretty space, and not to mention, with HUNDREDS of loved ones. I will never forget hugging each person as they came through the receiving line and thinking, "We are so loved!" My heart overflowed. To this day, I still remember who gave us most of our wedding gifts and fondly think of the givers whenever I use them. Some of those in attendance are no longer with us, and I am glad I have the memory of their presence on our wedding day. Three-thousand six-hundred and fifty-two days ago, we were little seedlings just starting out in a vast, mature forest. We had no idea what life would hold for us. We didn't know about the precious children who would join our family, the tragic losses we'd experience and the great victories we'd share. We didn't know how much we would grow and learn. We were just excited to be together! And here we are today -- still a little green in the branches, still not as tall as some of the trees that surround us, but taller than we were and able to see more clearly than before. And we continue to move upward together, always reaching toward the sun despite the storms that threaten to uproot us. There's no one I'd rather grow up with than Dillon, and I'm grateful every day that we found each other. Happy anniversary, Honey. I love you forever. BABIES. Really cute babies. ;) Happy anniversary, lovebirds!